Experience Wyoming, up close and personal. M & M Ranch Vacations and Outfitting offers working ranch vacations, hunting and wildlife tours. Surrounded by the Medicine Bow National Forest, our ranch is located in the center of a superb historical and wildlife region. The ranch itself includes a lake and over twelve miles of river bottom. We are offering a genuine ranch experience. 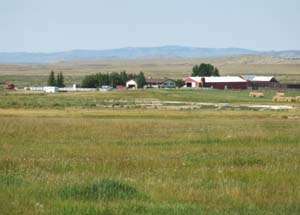 This isn't an imitation dude ranch; this is an actual functioning Wyoming Cattle Ranch. 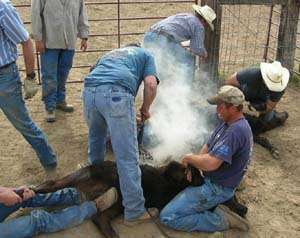 Take part in calving, branding, cattle drives, and more. Nature and Wildlife Tours. In this remote area of Carbon County, wildlife viewing opportunities are unparalleled. 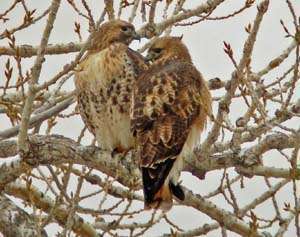 The hills teem with birds, animals, and waterfowl: bald eagles, golden eagles, sage grouse, black footed ferrets, many varieties of hawks, prairie dogs, ducks, and geese. Several less common species can be viewed throughout the region. We are surrounded by unique and spectacular scenery. The land seems to breathe the spirit of the Old West and Pioneer Heritage. You'll find numerous fossils and geological formations that tell the story of our earth's history. Tramp the hills and smell the evocative scent of sagebrush, and let it take you back to a simpler time. Elk - We are surrounded by three other large ranches that offer limited or no hunting. This allows the hunter to harvest a trophy calibre animal. Deer - Our meticulously managed deer herd will not disappoint. Hunting pressure is minimal which allows our clients the opportunity to harvest a trophy buck. Antelope - Wyoming is synonymous with fantastic antelope hunting. The sheer number of antelope in the Medicine Bow area allow the hunter to selectively pick his/her trophy animal. Bison - The Medicine Bow area was once teeming with vast herds of the impressive beasts. One can occasionally locate remnants of the animal in the form of bones found in old buffalo runs in the mountains. You'll have the opportunity to harvest either a trophy bull or a cow with your weapon of choice. Space is limited, and early booking is required. Waterfowl - Early season duck and goose hunting in this area rivals even the best properties that we encountered while outfitting in Eastern Colorado. 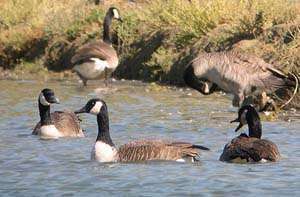 Both ducks and geese are plentiful in the area in October through February. We hunt over decoys along our lakeshore, river bottom and ponds, or from one of our spacious pit blinds. We invite you to experience quality 'in your face' duck and goose hunting. Coyotes - Coyotes have long been the cattlemen and the sheepmen's bane. Fortunately for the sportsman, the geography of our ranch offers optimum shooting opportunities. We use mouth or electronic calling methods depending on hunting and weather conditions. Come experience the visceral thrill of close proximity coyote hunting. 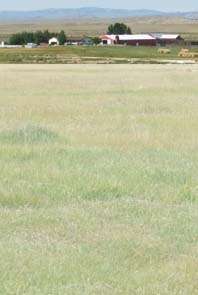 Prairie Dogs - Prairie dogs are plentiful and managed with the shooter in mind. We take in only one shooting party per week which allows us to rest each town to optimize shooting opportunities. We invite you to partake in some of the best prairie dog hunting in the west. Necessary equipment include a recoil pad and plenty of ammunition!